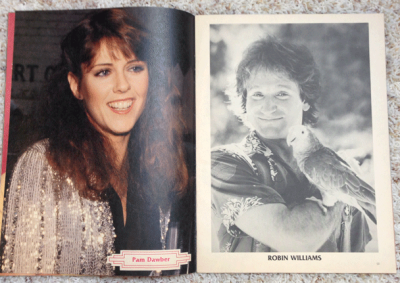 This is an old magazine, and I'm afraid it has lost it's cover over time. A couple of pages have been removed, no doubt to be posted in a locker or taped up onto some young teenager's bedroom walls. But there are still plenty of photographs to moon over. Each teen icon takes up a whole page all to themselves. Most are in black and white, but several are in color. 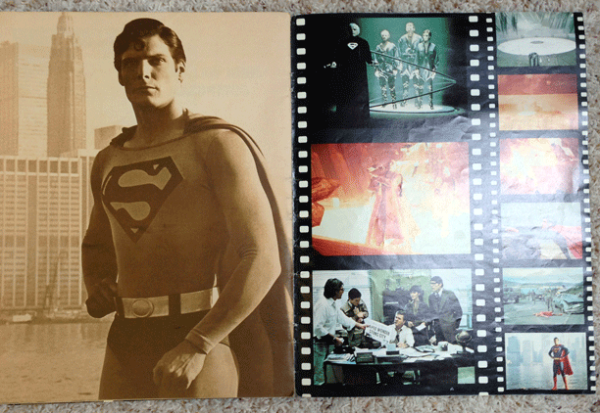 There is one page of wallet sized photos to clip and carry in your wallet. 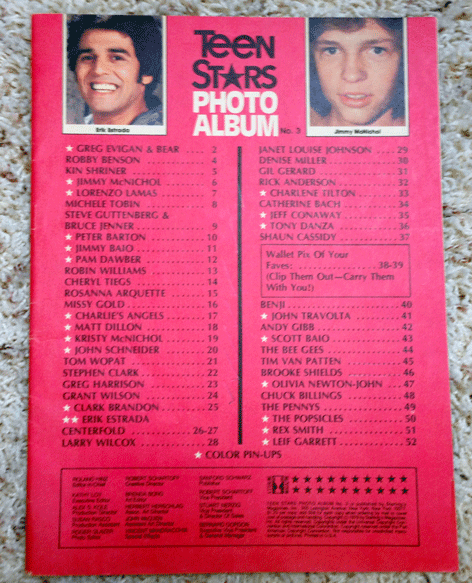 This collection of posters includes: Robby Benson, Kin ShrinerJimmy McNichol, SteveGuttenberg and Bruce Jenner, Peter Barton, Jimmy Baio, Pam Dawber, Robin Williams, Cheryl Tiegs, Rosanna Arquette, Missy Gold, Charlie's Angels, Matt Dillon, Kristy McNichol, John Schnieder, Tom Wopat, Stephen Clark, Greg Harrison, Grant Wilson, Janet louise Johnson, Denise Miller, Gil Gerard, Rick Anderson, Charlene Tilton, Catherine Bach, Jeff Conaway, Tony Danza, Shaun Cassidy, Benji, John Travolta, Andy Gibb, Scott Baio, The Bee Gees, Tim Van Patten, Brooke Shields, Olivia Newton John, Chuck Billings, The Pennys, and The Popsicles. 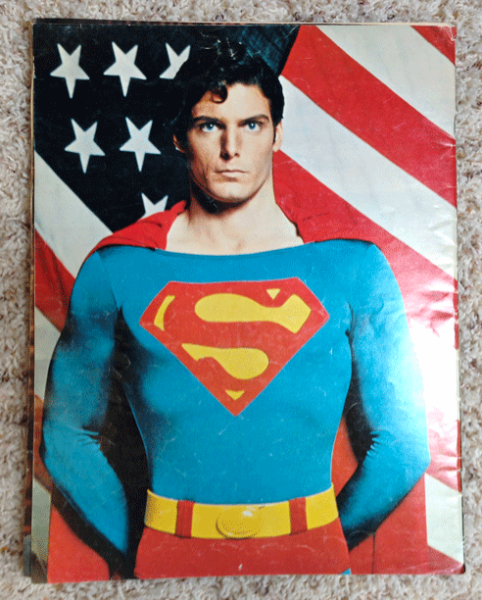 I'm asking $25.00 for it because it has a lot of people who are currently in the limelight featured in this magazine: Caitlyn Jenner when she was known as Bruce, Robin Williams, Matt Dillon, and John Travolta, to name a few. See photos below. This magazine has been leafed through often by some young hand, and has a lot of dog-eared pages, and several of them are loose. 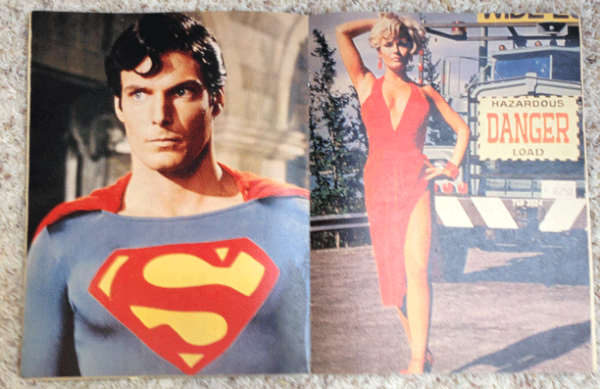 The pages have yellowed with age, but they are all present and accounted for, including the Centerfold of a flying Superman. 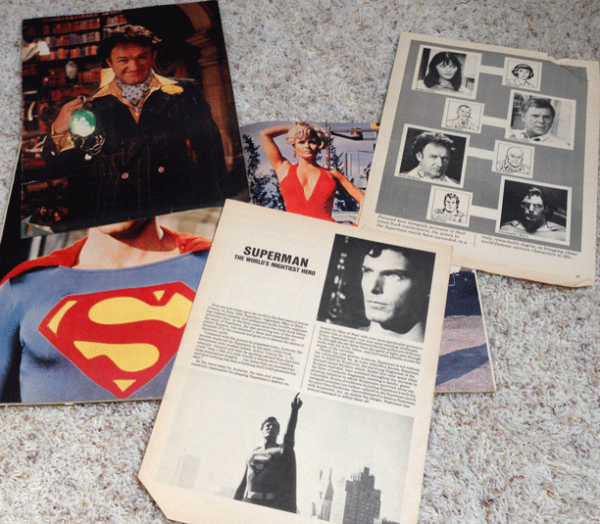 It has articles discussing the stars, costumes, set designs, and special effects. It's mostly black and white, but there are a lot of color pages as well. 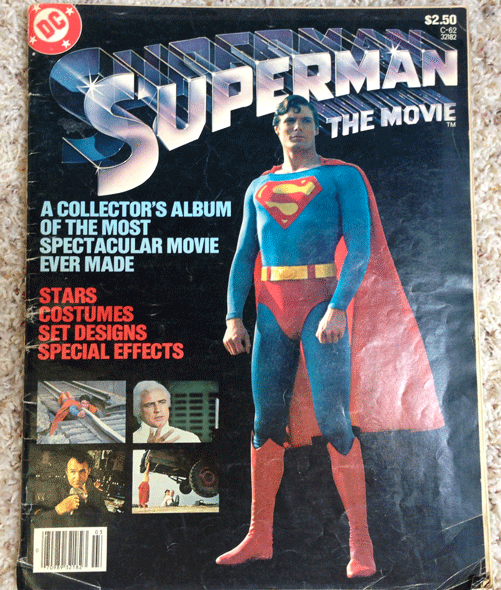 There is an article on Marlon Brando, Gene Hackman, Christopher Reeve, Margot Kidder, Ned Beatty, Jackie Cooper, Glenn Ford, Trevor Howard, Valerie Perrine, Maria Schell, Terence Stamp, Phyllis Thaxter, Susannah York, Production Designer John Barry, Costume Designer Yvonne Blake, and Composer John Williams.